A not-for-profit organization that supports programs and services offered by the Township that foster the independence and well being of older adults. Based on need, the organization seeks to enhance their quality of life by acting as a resource for funding programs, services, education and information. As a registered 501(C)3 charitable organization, monetary donations to Friends for Downers Grove Township Senior Citizens are tax deductible (Tax ID# 45-3952379). 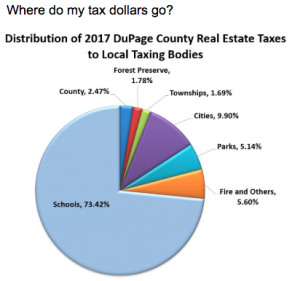 Checks can be made payable to: Friends for Downers Grove Township Senior Citizens and mailed to Friends for Downers Grove Township Seniors, 4340 Prince Street, Downers Grove, IL. 60515 or brought directly to the office. The Township of Downers Grove is seeking donations to preserve Downers Grove’s history. The Township’s Oak Hill and Oak Crest Cemetery Foundation, a 501C3, is asking for support to assist in replacing the fencing located at Oak Hill and Oak Crest cemeteries. These cemeteries contain a history of Downers Grove’s founding fathers, their families and a rich history of the community. Other agencies have generously donated their time and labor to aid in the restoration of the cemeteries. Recently, local Eagle Scouts constructed three walk-in gates for pedestrian traffic through the cemeteries. Other community agencies have donated their time to help clean up brush and headstones within the properties. Later in 2016 the Township of Downers Grove will conduct a headstone Restoration Program for many of the historical stones located in the cemeteries. As much as these efforts are greatly appreciated and effective, they are just not enough to maintain our historical landmarks. Generous donations would help ensure the safety of the respected members of the community who are buried within the cemetery grounds and maintain the dignity and peace that they deserve. Please donate today and help maintain Oak Hill and Oak Crest Cemeteries. You can donate by check, make it out to: Oak Hill and Oak Crest Foundation, mail to: 4340 Prince Street, Downers Grove IL 60515.